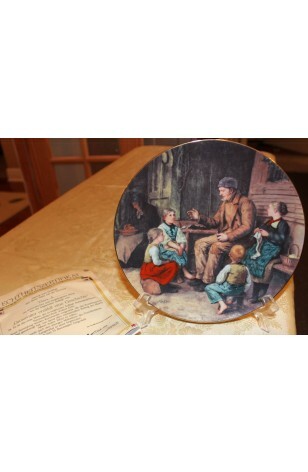 Langenthal Swiss China Works, Collector Plate, by Albert Anker, called "Grandfather Tells a Story". Made in 1986. Original Box and Certificate. An outstanding "Boxed", with "Certificate", Collectors Plate of Albert Anker's "Grandfather Tells a Story" produced by Langenthal Swiss China Works. Circa 1986. This is a Picture of Four (4) Children kneeling and/or sitting at Grandpa's feet, listening to him. It is a period piece that looks to be the late 1800's based on the clothing. Great Gift for any Grandfather... Comes with Original Box and Certificate. Gold Rim on Plate. Great Condition. An outstanding "Boxed", with "Certificate", Collectors Plate of Albert Anker's "Grandfather Tells a Story" produced by Langenthal Swiss China Works. Circa 1986. This is a Picture of Four (4) Children kneeling and/or sitting at Grandpa's feet, listening to him. It is a period piece that looks to be the late 1800's based on the clothing. Great Gift for any Grandfather... Comes with Original Box and Certificate. Gold Rim on Plate. Very Good Resale Condition with no known defects.